P6 Professional Copy Project Runs as a Scheduled Job. 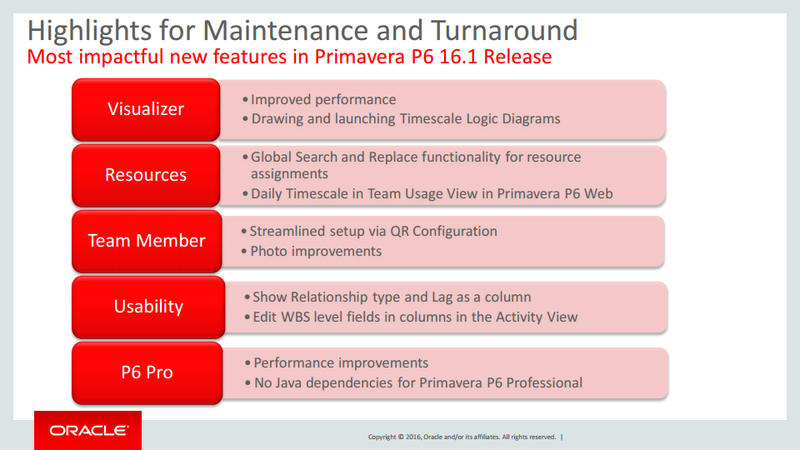 P6 Professional Add Baseline Runs as a Scheduled Job. P6 Professional Add Reflection Runs as a Scheduled Job. P6 EPPM Basic View on the Activity Page. P6 EPPM HTML Based Open Project Dialog. P6 EPPM Enhanced Filter Criteria For Codes. P6 EPPM Filter on Rolling Dates. P6 EPPM Support for MS Project 2013. 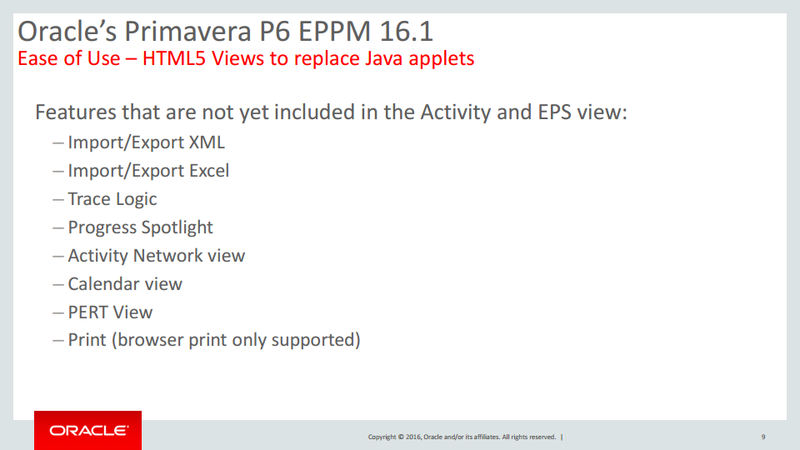 P6 EPPM Scheduled Import and Export. P6 EPPM Asynchronous Import and Export. 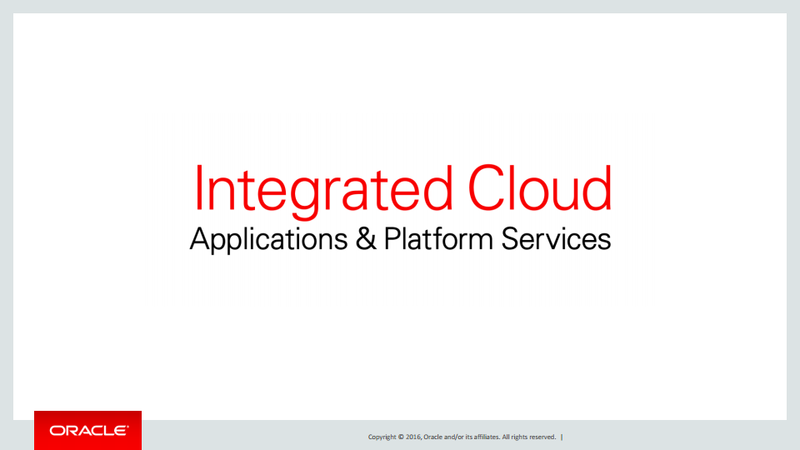 P6 EPPM Web Services and API Features have been added for P6 EPPM. P6 EPPM Check Schedule Reports Can be Generated Through Web Service. P6 EPPM Go Straight to the View Service Status Dialog from Notifications. 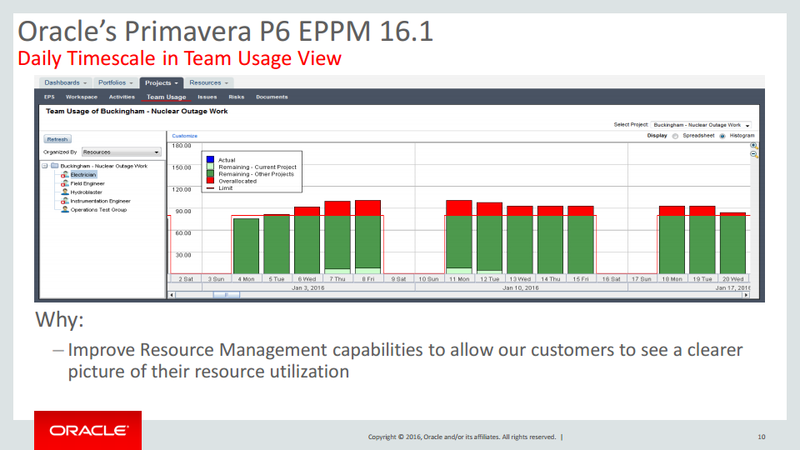 P6 EPPM View Resource Usage When Assigning Resources to Activities. P6 EPPM Improved Sample Reports for Auditing. 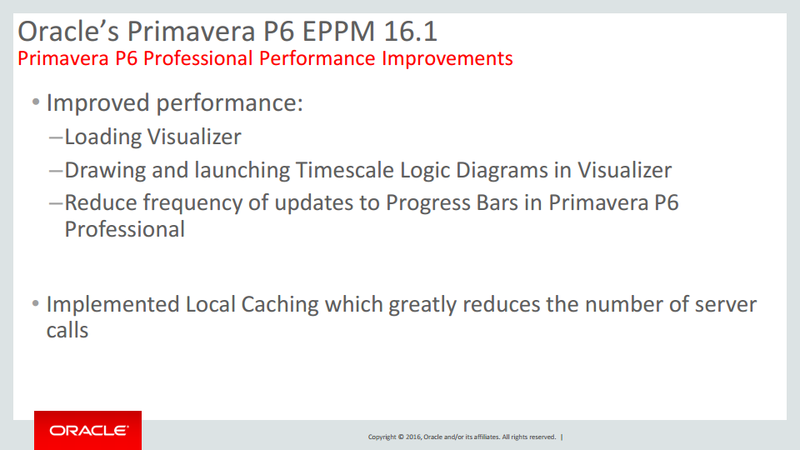 P6 EPPM Quickly Publish Baselines for Reporting. 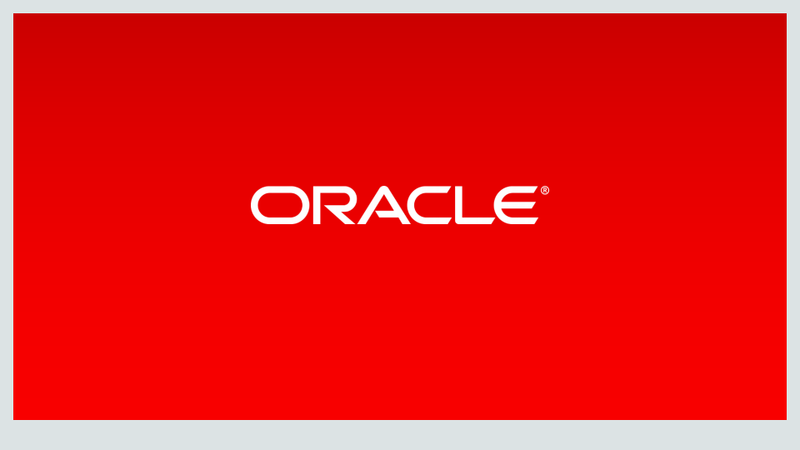 P6 EPPM Database Rollback is Available to Users Upgrading the P6 EPPM Database from Earlier Versions. 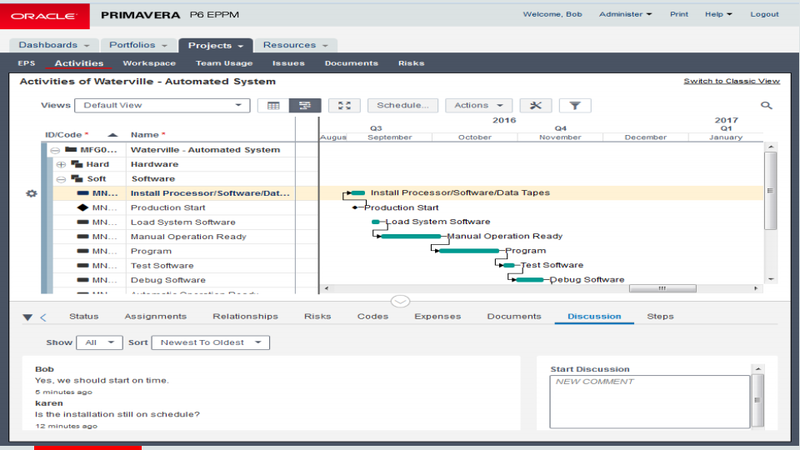 P6 EPPM Close All Open Projects From the Right Click Menu. 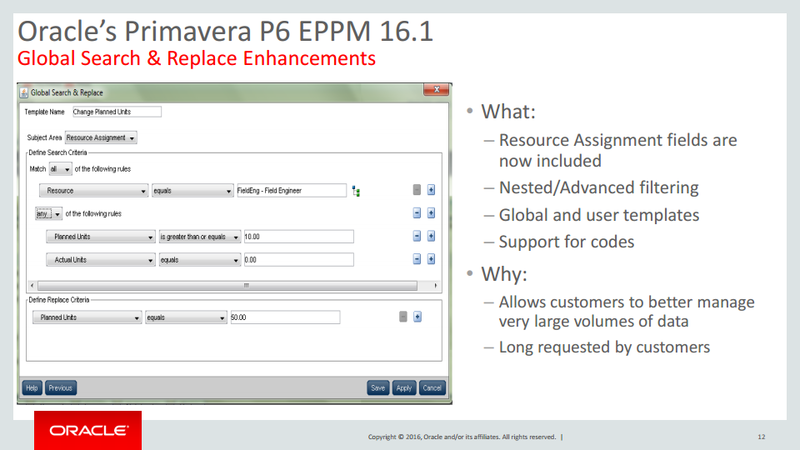 P6 EPPM Save More Details With Views. P6 EPPM Never Lose Your Place When Sorting A View. 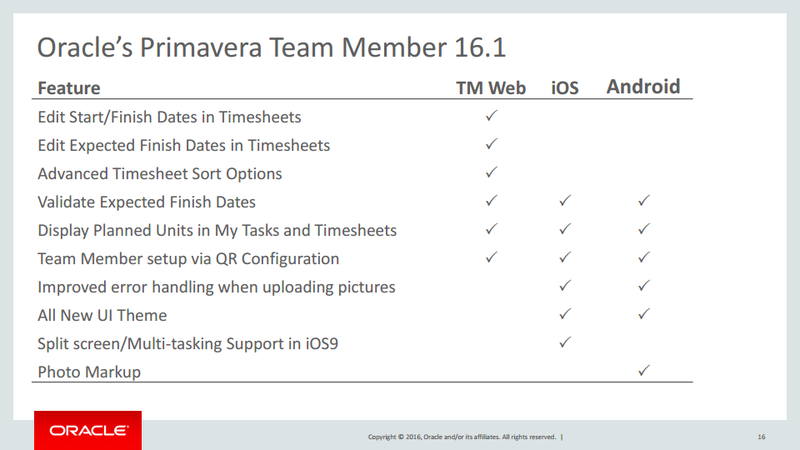 P6 EPPM Assign Yourself to an Existing Task in Team Member and P6 for Android and iOS. 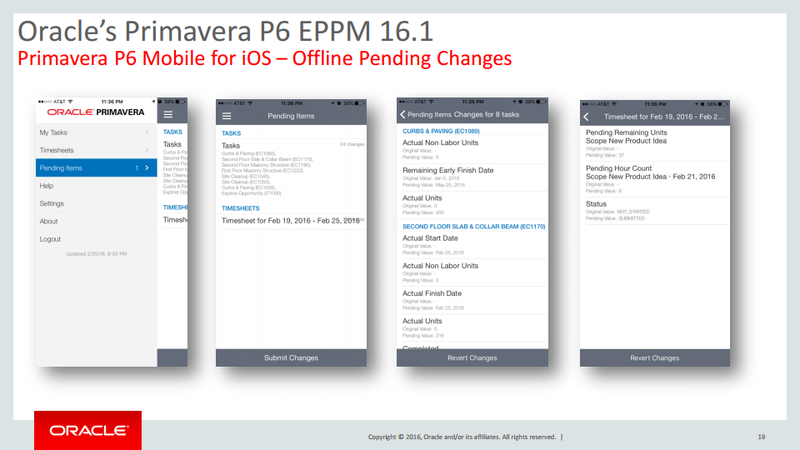 P6 EPPM Improvements to Timesheets in P6 for Android and P6 for iOS. 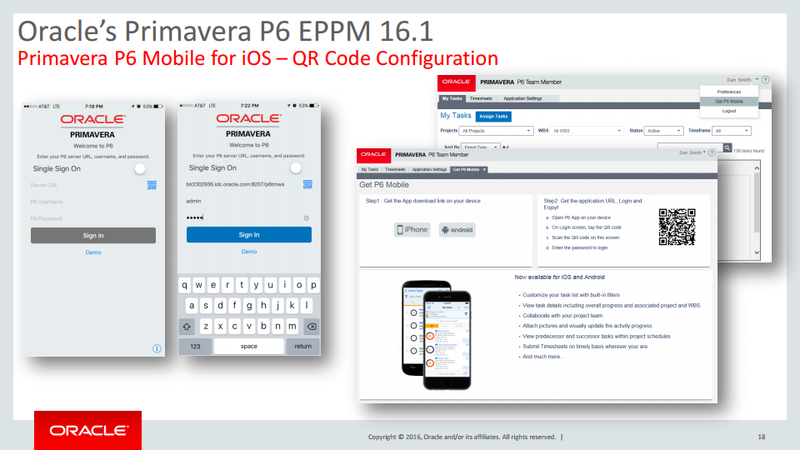 P6 EPPM Choose to Display the Project ID Along With The Project Name in P6 for Android and P6 for iOS. P6 EPPM Search For and Replace Data Globally. P6 EPPM Offline Mode in P6 for iOS is Automatic. P6 EPPM Demo Mode in P6 for iOS. P6 EPPM Crop and Annotate Images Before Assigning Them to Tasks in P6 for iOS. P6 EPPM See Your Tasks on your Calendar in P6 for iOS. P6 EPPM View and Navigate to the Location of a Task from P6 for iOS. P6 EPPM Windows 10 Support. P6 EPPM Microsoft Edge Browser Support. P6 EPPM P6 Integration API Deprecated. P6 Professional Asynchronous Import and Export. P6 Professional P6 Professional can be Installed in 32-bit or 64-bit. P6 Professional Job Services is Available for 64-bit P6 Professional. P6 Professional Continue to Work While a Project Copies in the Background. P6 Professional Scheduled XML Import and Export. P6 Professional Enhanced Filter Criteria For Codes. P6 Professional Startup Performance Improvements for the Resource Histogram and Spreadsheet. 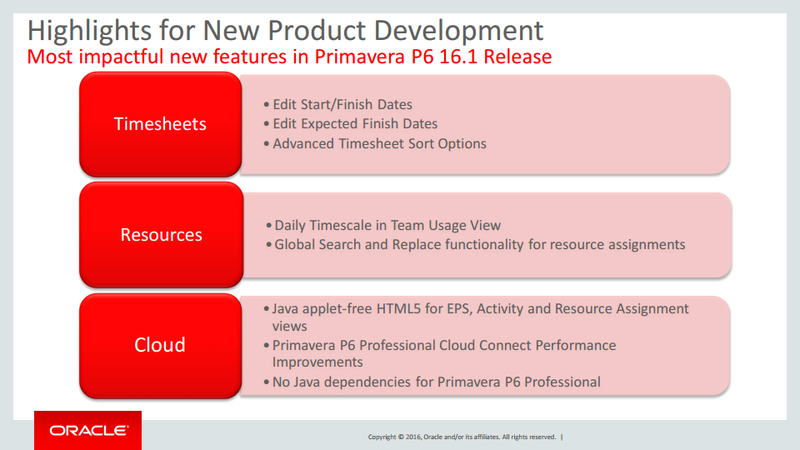 P6 Professional Support for MS Project 2013. P6 EPPM Schedulling in the Basic View of the Activities Page. P6 EPPM Create Custom URLs to Access Pages Directly. P6 Professional Software Development Kit (SDK) Deprecated. P6 EPPM Basic View on the Assignments Page. For more efficient work in the Assignments page in P6, you can use the Basic View, which allows you to perform the most common actions quickly and easily. 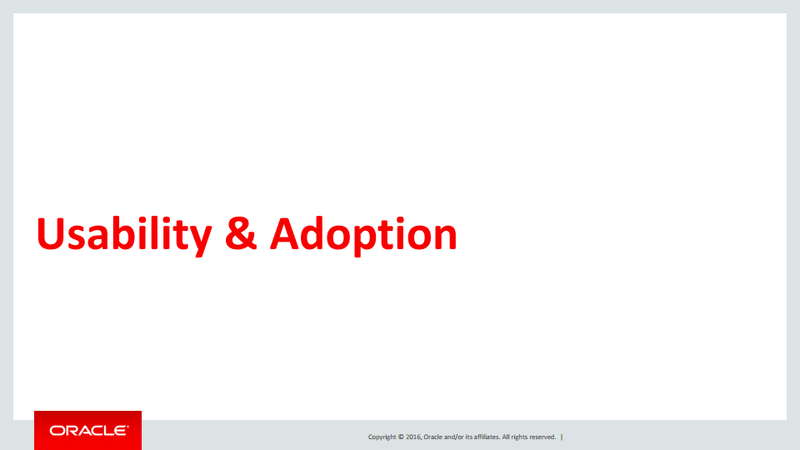 The basic view uses HTML rather than java applets. When you need to perform more complex tasks, you can switch to Classic View. Basic View on the Assignments Page. P6 EPPM Configure Events in Application Settings. 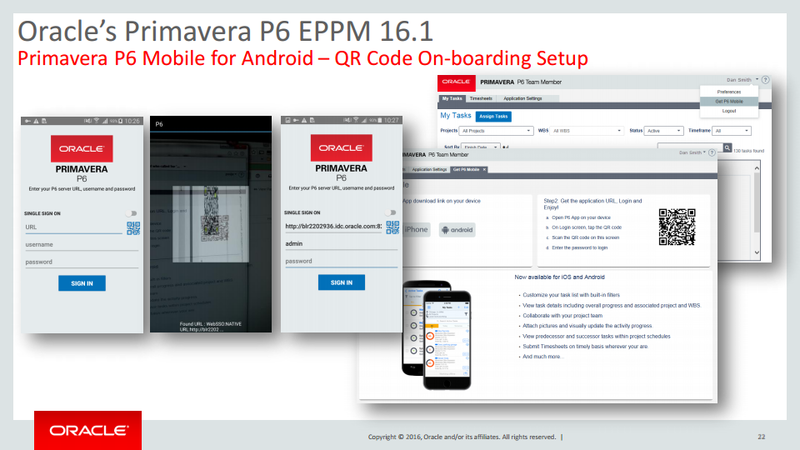 P6 EPPM Configure P6 For Android or iOS With a QR Code in TeamMember. 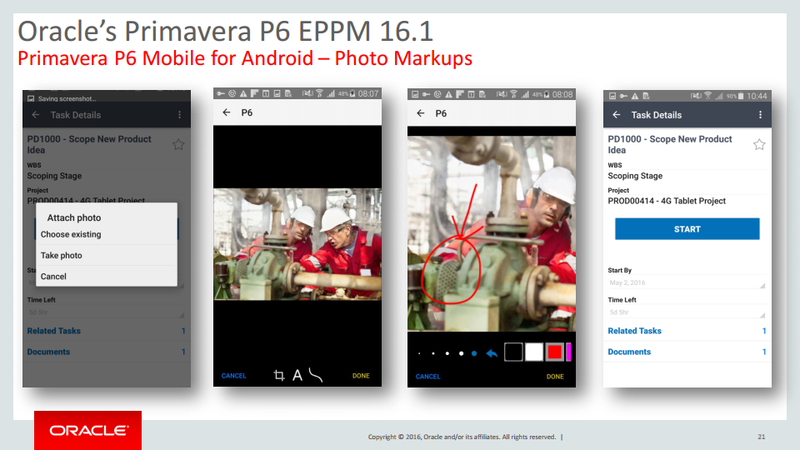 P6 EPPM Crop and Annotate Images Before Assigning Them to Tasks in P6 for Android. 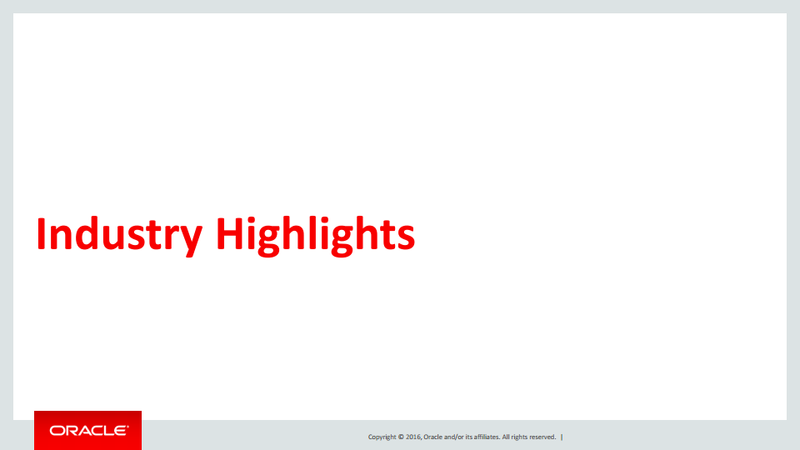 P6 EPPM Documentation Library Improvements. 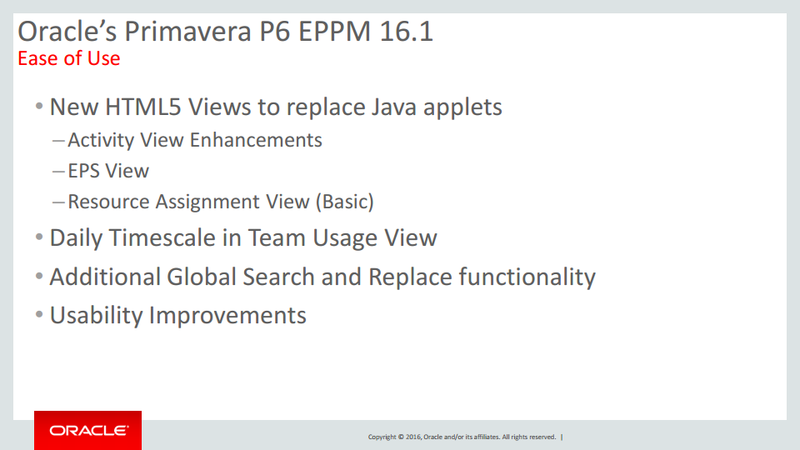 P6 EPPM Enhancements to Global Search and Replace. P6 EPPM Enhancements to Migration Tool. P6 EPPM Functionality Added to the Activity Page. - Customize your view in the Standard View of the Activity Page to specify the columns you would like to show, and specify how to group, sort and filter your data. You can also configure bars and the Gantt chart. - Display WBS fields as columns in the activity grid and edit that data, and configure WBS information and earned Value settings for WBS. - Schedule projects, maintain baselines, participate in discussions, and attach documents to tasks in the Standard View of the Activity Page. 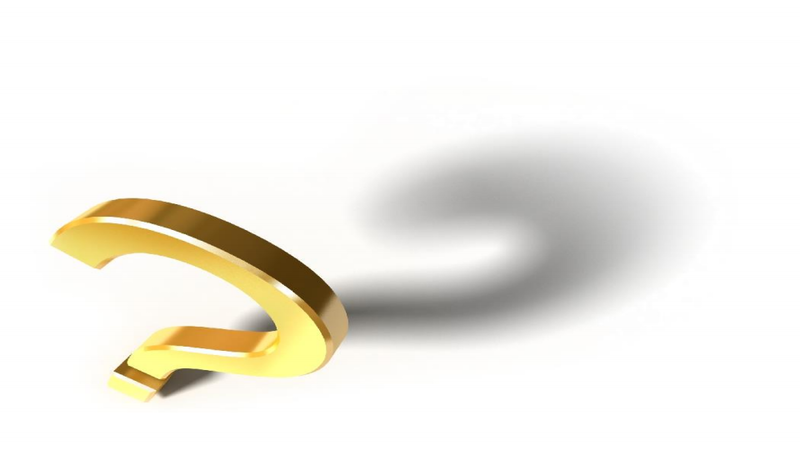 - Access information about earned value, codes, expense, risks, and steps. 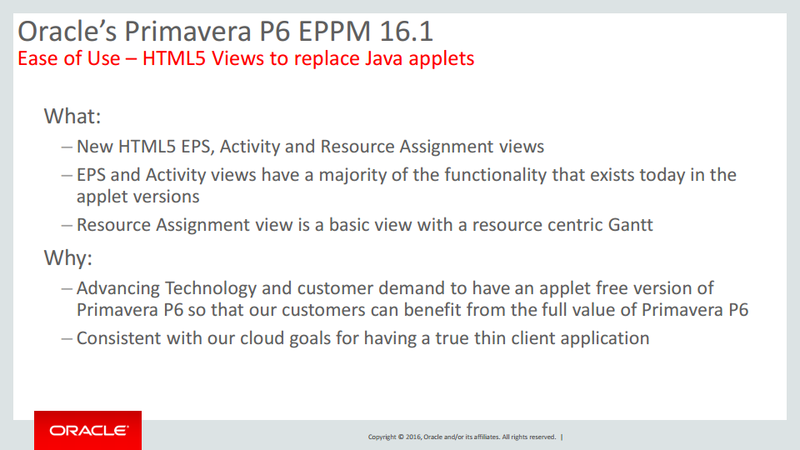 P6 EPPM HTML View on the EPS Page. P6 EPPM Importing and Exporting P3 projects is no longer supported. 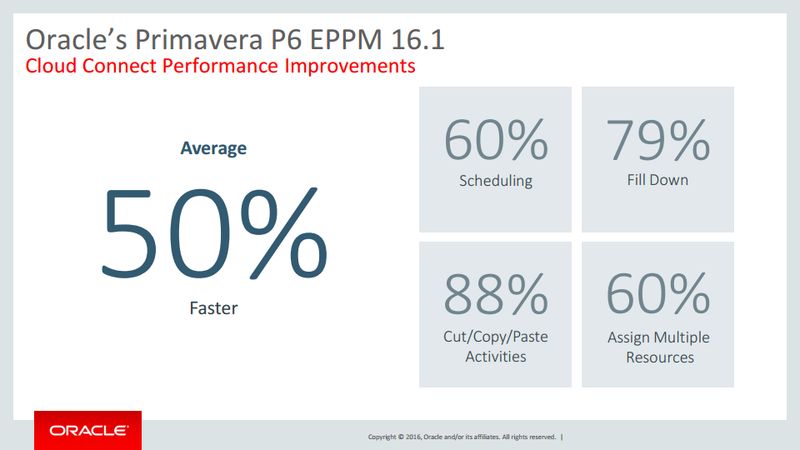 P6 EPPM Improved Copying of Activity Data when Copying Projects. P6 EPPM Improved Help Style in P6 for iOS. 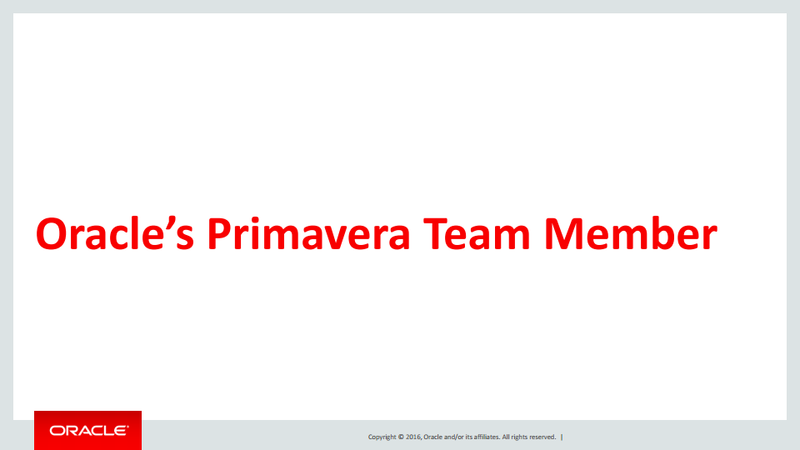 P6 EPPM Improved Visibility And Access to Dates For Team Members. In TeamMember web, you can view planned units in My Tasks and Timesheets. You can edit the Start Date, Finish Date, and Expected Finish date for a task in Timesheets. Expected finish dates cannot be in the past. P6 EPPM Improved WBS Filtering In The Activity Page. P6 EPPM Oracle Web Services Manager (OWSM) for P6 EPPM Web Services Authentication. P6 EPPM P6 EPPM Web Services Enhancements. 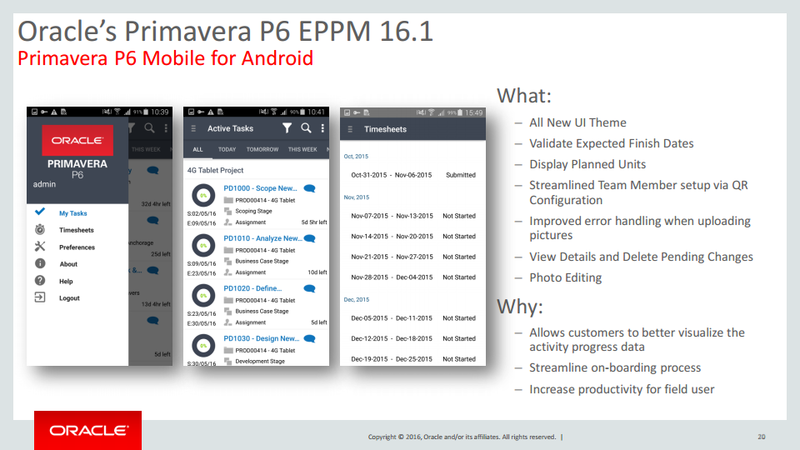 P6 EPPM P6 for Android and P6 for iOS have been redesigned. 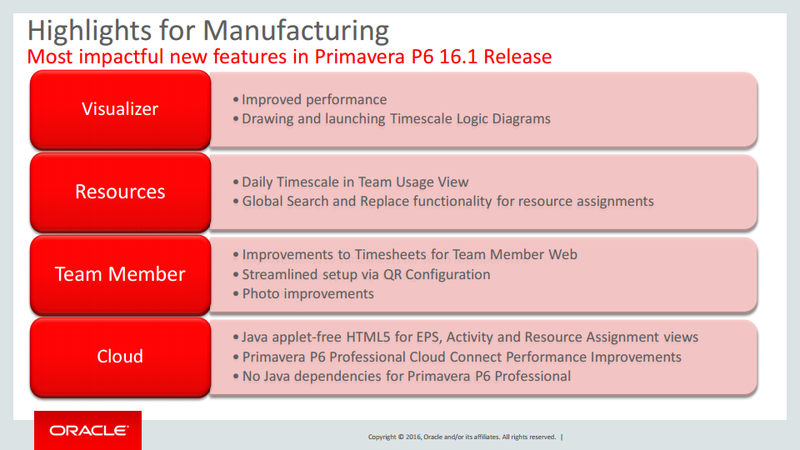 P6 EPPM P6 for iOS improvements. When you lose network access, P6 for iOS handles your online/offline state seamlessly. P6 warns when you go offline and the changes you make are be stored locally then automatically synchronised with the server when you are reconnected to a network. You can view and delete the changes which are pending while you are offline. 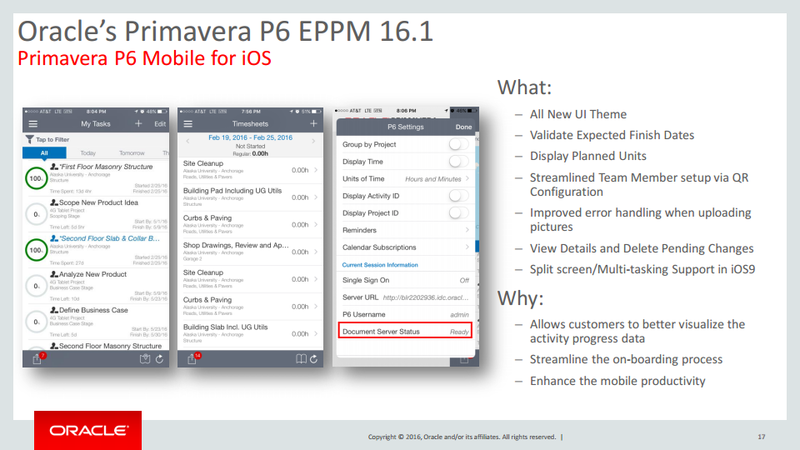 P6 EPPM P6 for iOS server requirement. P6 EPPM P6 Integration API Enhancements. P6 EPPM Receive an Email When a Publication Service Fails. P6 EPPM Show Relationship Type and Relationship Lag for Predecessors and Successors in the Activity View. P6 EPPM Sort Tasks in Your Timesheet in TeamMember. P6 EPPM Spread Team Usage By Days. P6 EPPM Unifier Import/Export Data Map Guide for Schedule Sheet Integration. 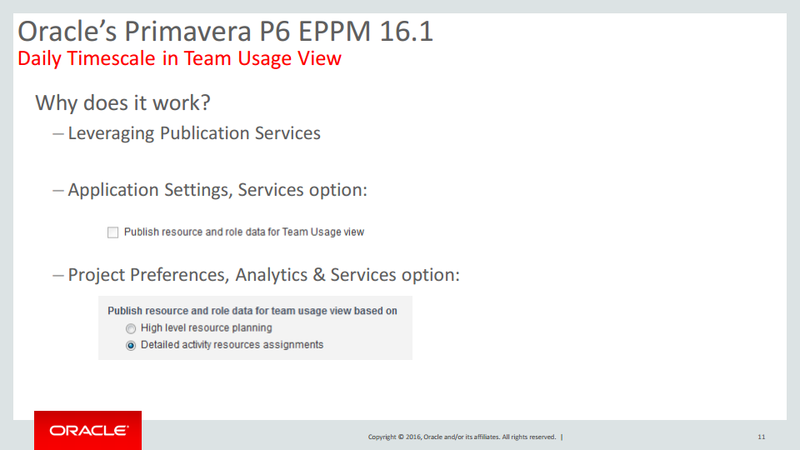 P6 EPPM View Primary Resource in the My Tasks Pane of TeamMember. P6 EPPM WebSphere Not Supported. P6 Professional Unifier Import/Export Data Map Guide for Schedule Sheet Integration. P6 Professional .NET Application to Configure ClickOnce. P6 Professional DBConfig Options for Cloud Connect. P6 Professional Documentation Library Improvements. P6 Professional Enhanced Logging and Debugging. P6 Professional Importing and Exporting P3 and Microsoft Project MSP file types is no longer supported. 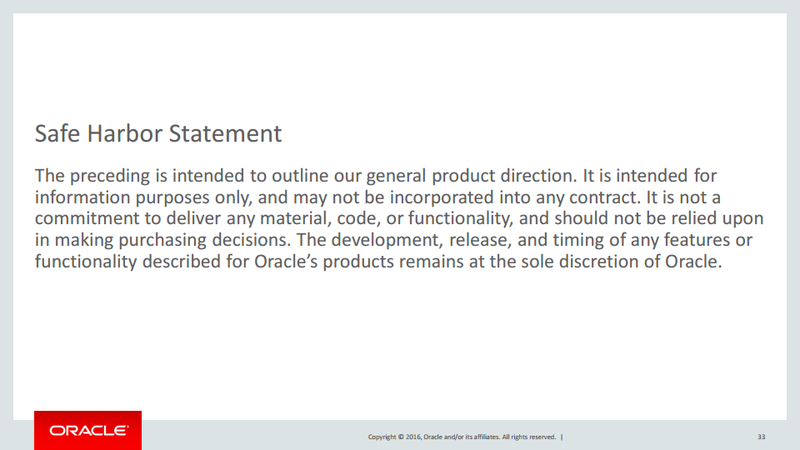 Installing the Java SE Runtime Environment (JRE) is optional. 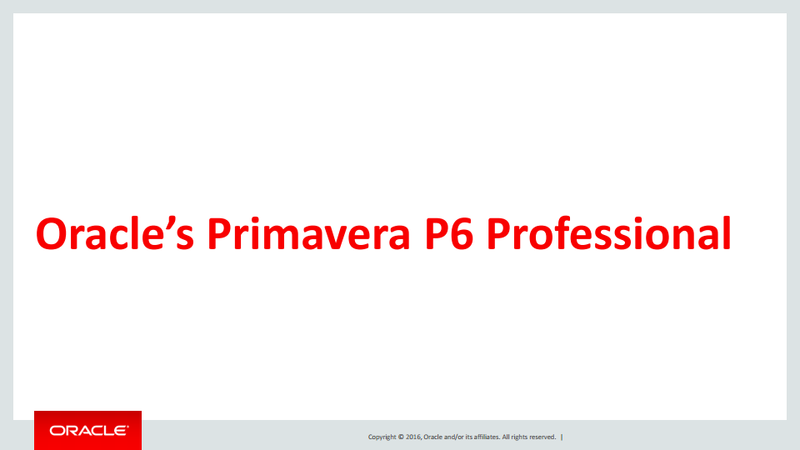 P6 Professional Java Not Required. P6 Professional Local Installations of Help are Provided on OTN. P6 Professional Schedule Comparison in Visualizer. P6 Professional Show Relationship Type and Relationship Lag for Predecessors and Successors on the Activity Page. P6 Professional Standalone Database Upgrade Tool. P6 Professional Microsoft SQL Server Deprecated. P6 EPPM Microsoft SQL Server Deprecated. P6 EPPM The SharePoint connector is deprecated. 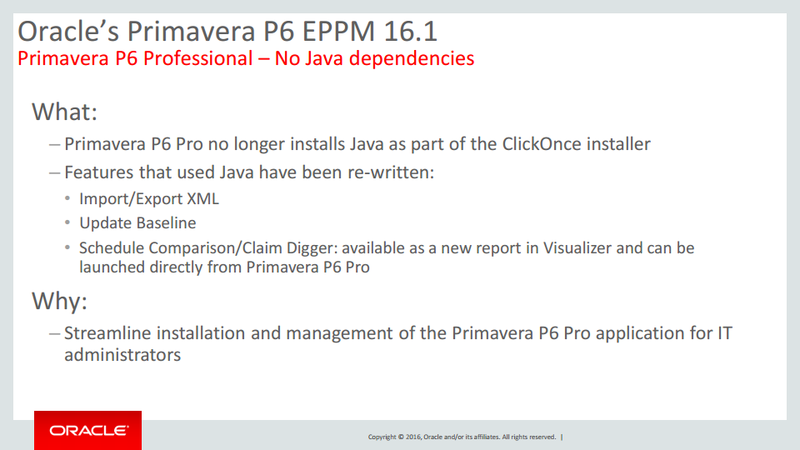 P6 EPPM Enterprise Manager for Oracle Primavera P6 EPPM Plugin Deprecated.